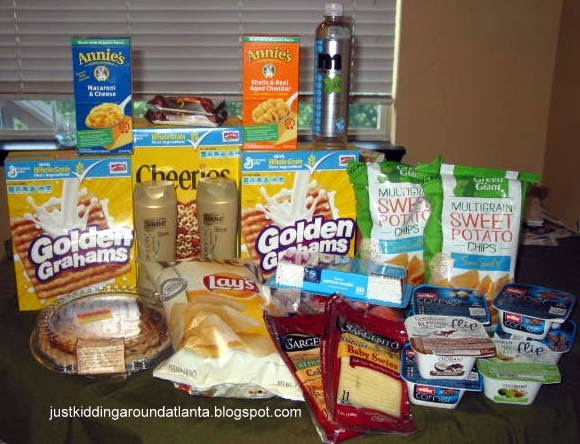 Looking to stock up on some of your favorite General Mills brands? Your friends at Kroger have got you covered with our June Value Event! From June 2nd - 8th, take advantage of great savings on some of your favorite brands from General Mills like Pillsbury, Totino´s, Chex Mix and Yoplait. 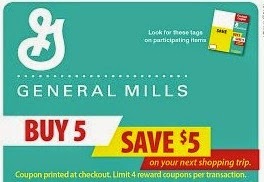 Just buy 5 participating General Mills products* in the same shopping trip and get a catalina coupon (prints out at the end of your transaction, on receipt paper) to save $5 on your next visit to Kroger. Look for special tags on participating products. * For more details on this savings event, please visit www.kroger.com. Chex Mix, Cheerios and other GM cereals, Green Giant Veggie Chips, Betty Crocker Fruit Snacks, Totinos Pizza, Suddenly Salad, and Hamburger Helper. I'm sure there were more! There are printable coupons for a lot of these items, too - check out one of my favorite pages, www.Iheartkroger.com for some links to those! I shopped Sunday night and grabbed some good deals! The bad news is that I don't have my receipt to share exact details. I was overcharged on one item but didn't catch it til I was in the van. Then I had to run back inside to take care of it! It was raining & stormy outside, and I didn't realize the CS clerk didn't give me my receipt back until I was out in the car for the 2nd time. Honestly, I just wasn't up for a 3rd trip out in that storm! So, I'll do my best to remember the prices and coupons I used! First transaction was for the buy 5, get $5 reward coupon event. I bought: 2 boxes of Golden Grahams (used a printable $1 off 2 coupon), and a box of Cheerios (used a printable .50 off 1 coupon that doubled to $1). I also grabbed 2 bags of Green Giant Sweet Potato Chips. I had 2 50c off coupons that both doubled to $1. Total for all this was appx $8 after coupons. I used a $25 gift card to pay, which was given to me by General Mills via BlogSpark. I also have a 50 cent coupon for the Green Giant chips on Savingstar that will deposit into my paypal account, so that is an extra bit of savings! The clerk printed out and gave me my "$5 off your next purchase" coupon. I turned around and used it on my second transaction. For this one, I bought: a quiche from the deli for $8, 2 pkgs of Sargento sliced cheese, ($5 total - then used 2 50 c off coupons, which each doubled to $1) 7 pkgs of yogurt for $1 each, 1 big bag of Baked Lays ($4), (I didn't have a coupon for the Lays chips but I consider them free, since I was able to use my $5 off coupon to pay for those!) 2 bottles of Moroccan Infusions Suave Shampoo (2 for $5, used 50 c off 2 coupon which doubled to $1) 2 pkgs of Annie's mac n cheese ($1 each) (used a 35c off coupon, doubled to 70c), 1 bottle of mint water ($1), Qtips ($1), and 2 Luna bars $1 each). Total for all of this after coupons was appx $26. I used the remainder of the gift card and then used our debit card for the last little bit. I was really pleased with my purchases and the cost! I love when Kroger does these reward coupon events! We are in love with Green Giant's Sweet Potato Chips - they are delicious! Katie loves their Veggie Tortilla Chips, too! So if you haven't tried these new chips yet, take advantage of this sale to try them out for yourself! There are other great pantry items in the sale, and if they aren't things you regularly eat, maybe consider buying 5 items to donate to a food pantry or shelter. I could have bought things like the Suddenly Salad or Hamburger Helper and gotten them practically for free, using coupons, but I wanted to get things on my grocery list for this week! Some tips before you shop this event... check websites like www.coupons.com, heartkroger.com and the Endorse and Ibotta apps (check out Ibotta's $10 Share the Love bonus by clicking the link) to see if you can find any coupons or offers to match up. General Mills & Blogspark are giving one of my readers a $25 Kroger gift card to use on whatever you like! This contest ends AFTER the June Value event, but I'm sure they will have another great coupon deal or sale when you receive your prize! There are some fun extra entry options with this contest - like signing up for your own Endorse, Ibotta and Savingstar accounts, so you can save $ too! If you don't see the contest widget from Rafflecopter below, click the link and you should see it! Thanks for entering, and good luck! Disclaimer: The information in this post, as well as my gift card and the prize gift card were provided by General Mills throughMyBlogSpark. Affiliate/referral links may be included in this post, as well. All opinions given are my own. I would like to get Honey Nut Cheerios fgor the kiddos! I comented on the Space give away! The only link I could get to work was the Savingsstar link. Any kind of cereal would be great. I would get the Hamburger Helper! I would stock up on Cheerios. are green giant chips a GM product? love them! i would buy lots of fresh produce!! We would probably stock up on Cheerios. I wish we had a Kroger where I live. We do have 3 Walmarts though. At least they take coupons but they don't double. Bummer, I could get some pretty good deals. I commented on: FREE can of OFF! Deep Woods Dry - 1st 3000 only! I would get cereal.. we can always use cereal.